This weekend I caught some fish. Although they didn't take me into my backing the real task was to figure out what worked and didn't work. I'm still trying to figure out how to effectively fish this turbid pond. No clarity changes the game. After throwing a few small flies and a few big flies it was clear that nothing was interested. I saw fish jumping and cruising but didn't have much luck hooking them. In the evening I saw what resembled a cruising shark in the shallows. My guess is that it was a big catfish or carp cruising around. I threw a few flies in front of it but no takes. 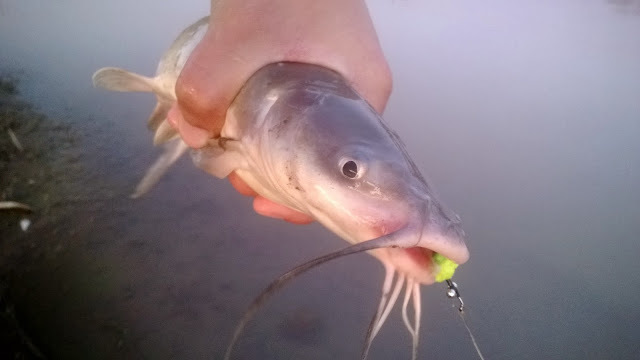 I did manage to catch a small catfish on a fly that I had tied specifically for the lake though. I'm slowly getting the hang of it. Hopefully I will be able to catch fish more consistently when I'm out there. The bass fishing has been tough and I haven't quite figured out how to catch them when I target them out here. I did see a few bass sitting on their beds but they spooked as soon as I walked by. There is no use targeting these fish as they are twitterpated for the spawn. It also isn't very nice to rip spawning fish off their beds as it is exactly the same as pulling trout of their redds. Just don't do it. The weather was beautiful but the only fish that were biting were the bluegills. They were eating bread chum and took whatever small fly I threw at them. Easy fun. Always fun to get into some bluegills on the fly. Wow, they are already spawning at Ellis huh? Very nice!